Don't leave home without your bike lock key or forget your code with this functional fantastic black WordLock 6 foot flexible steel bicycle lock. This 12mm thick steel cable core bike lock is a great moderate security solution to making sure your ride is still there and square when you return. The 6 foot long cable is long enough to lock your frame and tires onto many different types of hitching posts. The cable is coated with a stylish black rubber sheath that will protect your bike from nicks and scratches during locking and jostling. 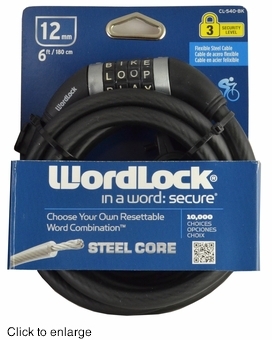 Best of all never forget your bike code again with the wonders of Wordlock. Set your own four letter resettable password from 10,000 letter combo and word choices to put together a word or letter combination that is both not easily crackable and positively unforgettable. This full package also comes with mounting kit so that the bike lock can be clipped to the bike frame as well as a limited lifetime warranty.